The theme of light has provided an ambient backdrop for our readings and liturgy these past two Sundays. Today, we continue with that theme of illumination but the Evangelist adds another element – ‘salt.’ I believe that everyone can appreciate that salt is an essential micronutrient for our bodies. Without a proper intake of salt, many of our body’s functions would be thrown into utter disarray. Our muscles would start cramping, and our ligaments and tendons would become brittle and lose their elasticity and strength. Eventually our bodies would begin to overheat and totally shut down due to a breakdown in our natural cooling process through perspiration. But apart from its nutritional attributes, ‘salt’ has far deeper significance in our lives. Some of you may remember that English expression ‘worth his salt’. In our modern day context, the expression seems altogether unintelligible. What has ‘salt’ to do with the value or worth of a person? But in the ancient world, salt was a precious commodity meted out for pay, hence the word ‘salary’ is derived from ‘salarium’, the soldier’s pay in salt. Can you imagine, with the collapse of our national and world economy, everyone being paid in salt? Blood pressures skyrocketing! 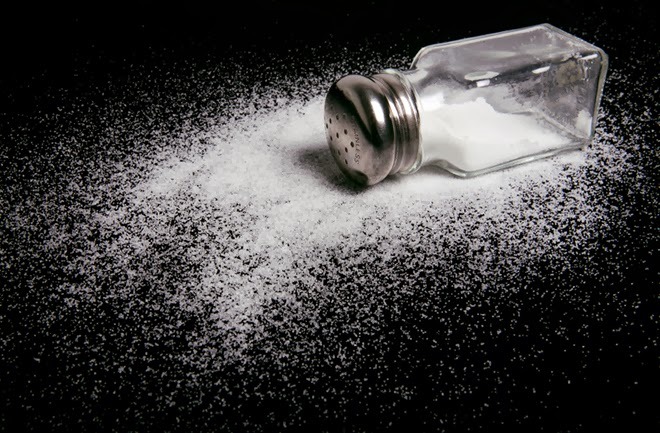 Salt was also used to preserve food, to prevent its decay and deterioration. Because of the lack of refrigeration, salt was used to preserve food, especially meat which would quickly spoil in the desert environment. Salted foodstuffs would provide sufficient supplies during long winters and seasons of famine. Salt is also used as a flavour enhancer. It enhances the most bland and tasteless of cooking. There are other customs connected with the use of salt. Newborn babies were rubbed with salt for what was thought medicinal purposes. Covenants of friendship were sealed by taking salt together (Numbers 18:19). If you have an opportunity, take a second look at Leonardo da Vinci’s painting, The Last Supper. Here, the scowling Judas is shown with an overturned saltcellar in front of him, thus identifying him as the betrayer, the one who has broken the covenant of friendship with Jesus. Finally, salt had a purifying quality, and thus was naturally seen as an important ingredient in exorcisms and rituals of cleansing and purification. Jesus says in the passage before us that we are the salt of the earth and we are the light of the world. What is most immediately obvious in this statement is the implication that there is some deficiency in the world that we live in. Jesus is implying that the world is tasteless. There is a rot setting in which is tearing our world apart. There is some deficiency in the world that we alone, uniquely as Christians, can supply. Just imagine feasting on bland tasteless food, day in, day out year after year, or even worse to feast on stale food. This is not the way God meant it to be. God meant for life to be rich and full, satisfying; a most excellent adventure that nourishes our souls. And the world has lost that. By its own choice the world has ripped the heart out of life, stripped it of its joys, created this monotone of tastelessness. The truth of that has been somewhat masked in our society by the superficial trappings of development and wealth. But look under the surface, part the facades, and see the struggles of the heart. Relationships are superficial. It doesn’t take too much to see people grasping for significance, searching without much success for meaning, purpose, value, a sense of worth—all of which they lack in some measure. People are filling the void with stuff and senseless pleasures, countless things that do not satisfy. Life is tasteless for far too many. Also, with the image of light that Jesus introduces here, he tells us that we are the light of the world. The implication is that this world is a dark place. There is a deficiency here. The world is in need of refreshing light—life-giving light. People are wandering about, lost, unable to see, bumping into all kinds of hidden dangers in the dark, not knowing where to go or how to live life well. This is where Christians, the salt of the earth and the light of the world come in. There is something about a Christian that doesn’t fit with the bigger picture – there is something about Christians that stand out. The metaphor of salt and light points precisely to this – Christians are different, they are counter-cultural, they swim against the tide, and they refuse to join the mad stampede of the masses. A Christian’s life has bite. Our very presence shakes the world from its complacent stupour, exposes the cover of lies under which it hides, and brings to the surface the deficiency of its barren soul. May we never flinch back from the true judgement we offer the world in the name of Christ, for we are the salt of the earth and light of the world. Being salt and light, you have something the world direly needs. God has placed you in the world for a purpose. The world needs you. As salt and light, you give testimony to the profound pleasure of walking with God. We become salt and light when the world sees us turning ourselves to God rather than inwardly towards ourselves, when we touch lives for good, when we affirm rather than gossip and criticise, listen rather than judge, forgive rather than get even. We become salt to the world when the world discerns, through us, that greed, despair, and anxiety can be replaced by contentment, hope, and peace of heart and mind. It is deficient without you and without what you bring to it that God has placed in you. You have worth to the world, though the world doesn’t always see it that way. In fact, the world often perceives us as threat. Frequently, the world perceives the flavour we Christians bring to it a tad bit too salty and spicy. The Christian gospel is an acquired taste; it requires connoisseurs of Truth to savour its flavour. Very often, the world doesn’t like the light we shed. It prefers the darkness for it thinks in the darkness it can get away with things—that God won’t notice. But the gospel also provides a potent warning, when our salt loses its taste or we keep our light hidden, that is we choose to blend into society and conform to its norms and morals, then we have no value to God – we become worthless. It is our distinctiveness and not our conformity which will serve to be the measure by which we will judged. We are to be salt not sugar. Many Christians are more concerned with sugar coating the Christian message than they are in delivering the hard truth of the Gospel. What good is a soldier who will not fight, a doctor who will not cure the sick, or a Christian who will not stand up against evil and its lies?